Remember our interview with Willy Nieuwveld, the bookmark collector from Holland? I hope it gave you a whole new view on bookmarks, that there are series, puzzles and antiques! For such a simple object, it’s unbelievable, right? Well, this time we are featuring a collector all the way from Norway! Liudmila Cernikoviene maintains a blog I have been following for several years now, so I get to see her new uploads and drool at her unique collection. Scroll down and drool with me. Hello, Liudmila! We‘re excited to see your collection, but first, can you tell us something about your self? My name is Liudmila and I was born in Lithuania. I have my family roots in Russia but now I live in Norway. I can’t tell anything astonishing about myself. I’m not registered in the Guinness Book of Records, didn’t invent the bicycle and wasn’t elected as a President. I’m an ordinary person with simple hobbies—travelling, reading, meeting friends. I love life as it is with all its advantages and disadvantages. I just have an interesting hobby: collecting bookmarks. I’m a passionate bookmark collector and hope to find more collectors, exchange bookmarks with them, show my collection to others and have a look at theirs. You can contact me, if you’re interested in bookmark exchange. Hope to find friends from all over the world! I have loved books since my childhood. A book has always been the best present to me. But I didn‘t use bookmarks back then – just an old ticket or a receipt to mark the page. I hadn’t paid attention to bookmarks until I met my husband, got married and moved to Norway eight years ago. There, at a shop, I saw my first bookmark, bought it and felt a passion to have more. Later, I realized how cute it is to have a lot of bookmarks, choose them according to a book’s genre, mood, even the color of the cover. My bookmarks then started adding up. I started asking my friends to bring me bookmarks from their travels. Why bookmarks of all things? I like reading very much. When I saw how many different bookmarks there are, I couldn’t help admiring them and wanted to have more and more. What was your first bookmark? I can‘t remember which one of these two. How big is the collection to date? About 3,000! I can’t tell the exact number as the collection still needs to be sorted out, photographed and catalogued. Woah! So how were you able to expand your collection to that size? I bring them from my travels and I also have a lot of wonderful friends who travel all over the world and bring bookmarks from the countries they visit. My special thanks to my dear friend Jurate who lives in Holland and loves travelling. She brings the most exquisite bookmarks in my collection. You can read about her travels here. I am also grateful to my friend Renolda from the US who made a big contribution when I started the collection. And some I got by exchanging with other collectors. 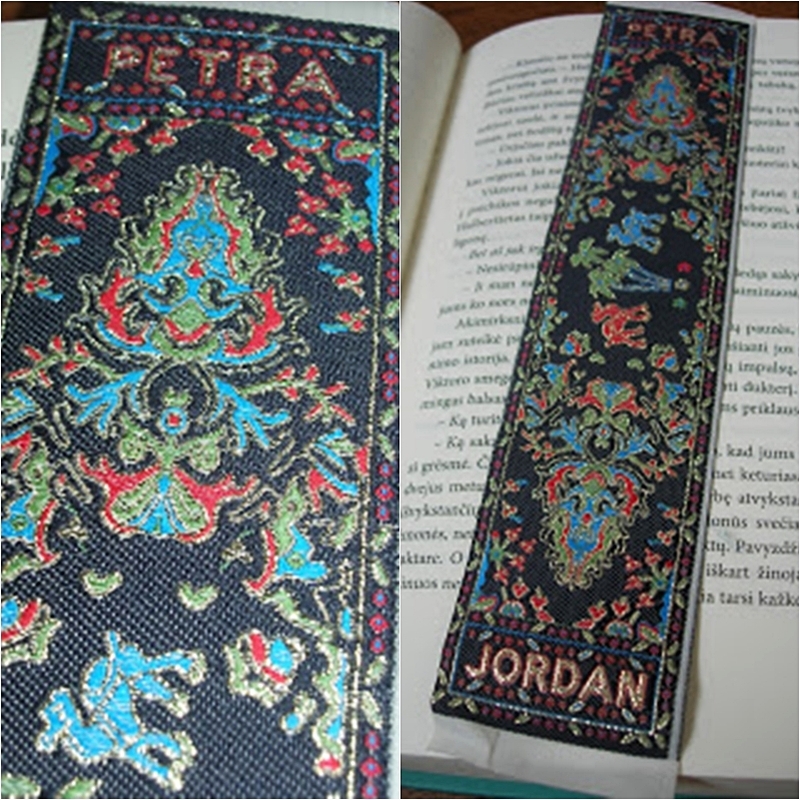 Could you tell us about some of your favorite bookmarks from your collection? It is very difficult to choose from such a big collection. All are dear and special. Perhaps, I could mention Russian ones. Somehow they are close to my heart. Perhaps it is because my roots are from Russia, so it feels sentimental. Examples of Russian bookmarks can be seen here. Any local bookmarks that’s great to show to collectors from other countries? Yeah, I can show you bookmarks from my native land Lithuania and Norway. 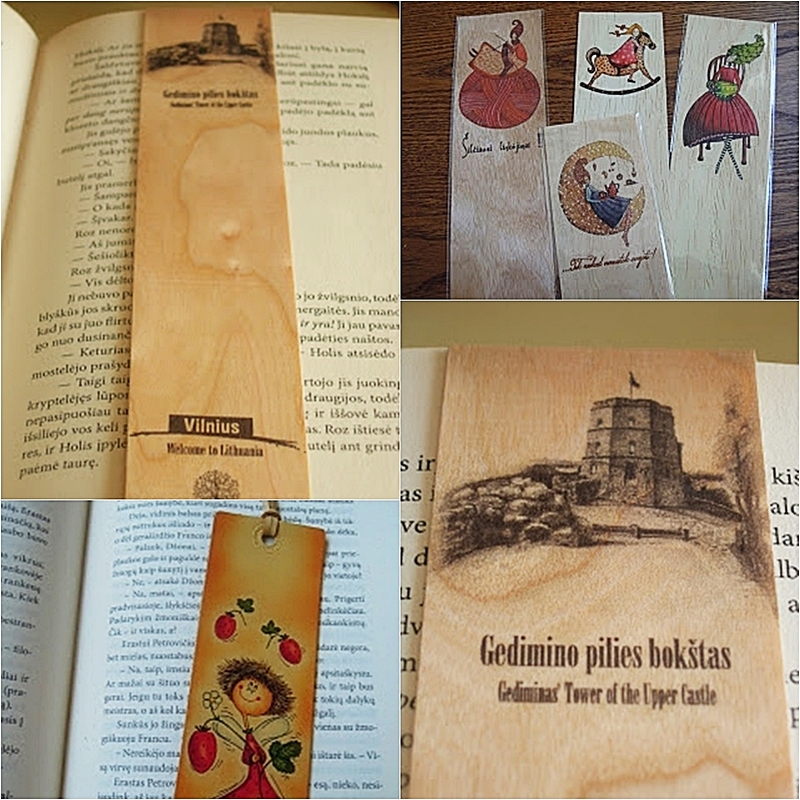 These are wooden ecologic Lithuanian bookmarks. We all know that wood is used for paper production, but wooden cards take only five times less wood than the paper ones. Wooden cards consist of 98% natural wood and 2% fast decomposing cellulose. No chemicals are used for wooden bookmarks, and energy, gas and water needed in the production is low. 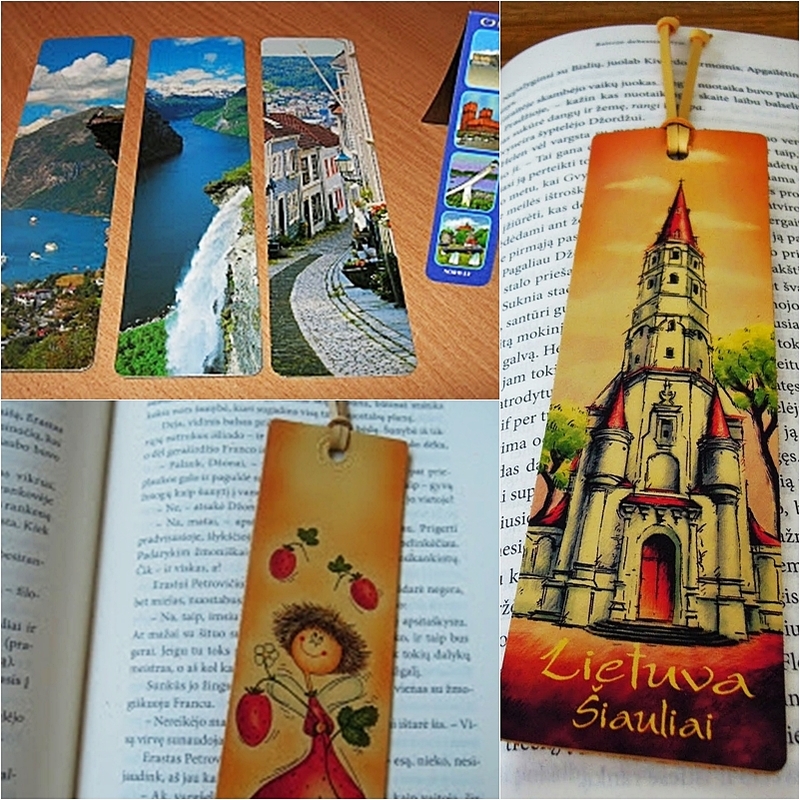 I have a lot of bookmarks with different sights of Lithuania. It is a subtle eco-message to the world inviting everyone to visit our unique land. 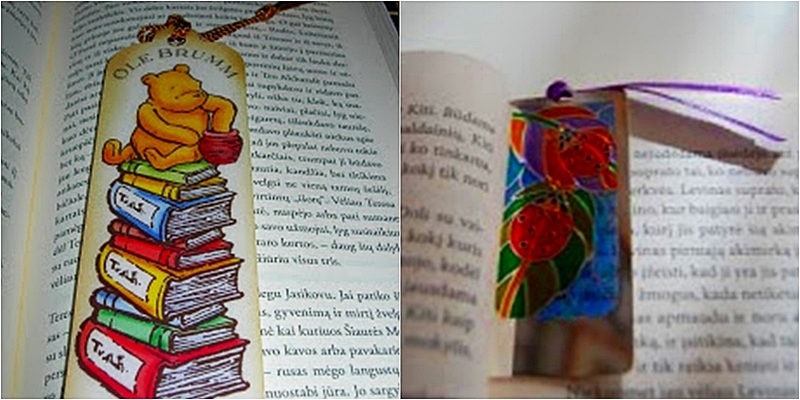 There are also leather Lithuanian bookmarks with tourist sites or just nice funny pictures. 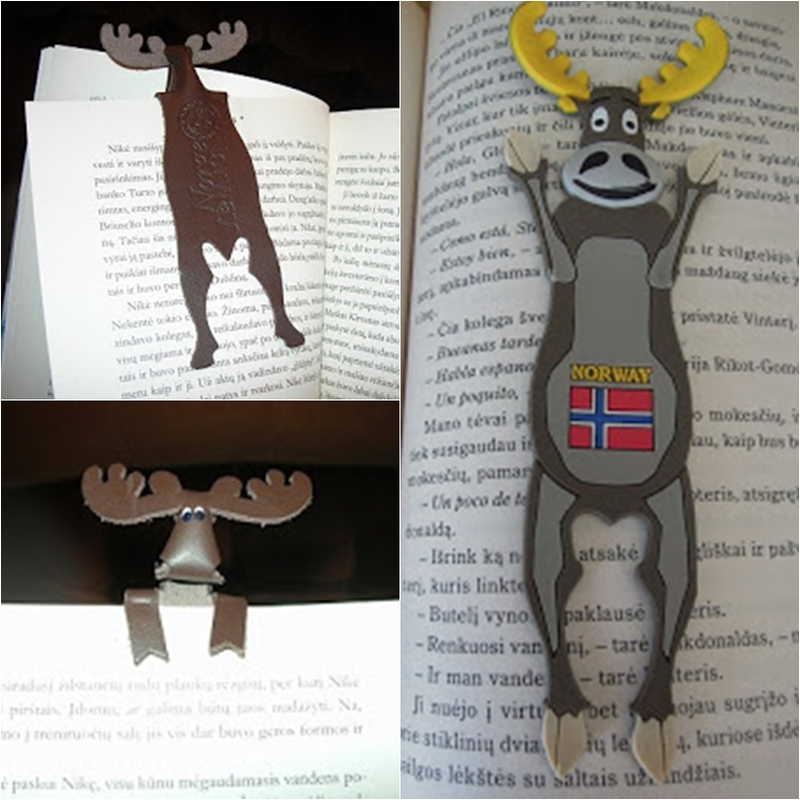 This is a Norwegian bookmark featuring a famous road sign: the elk. Elk is a common wild animal that roams all over Norway. It even ventures into cities in the winter when food is sparse in the woods. These animals most often, unfortunately, are killed because they can’t find their way back. Elks are also a great danger on Norwegian roads. Many cars have been completely crushed under the impact of this massive animal. In wooded parts of Norway, drivers must be very careful at dusk and night, when the elk tend to move around a lot. And some of my favorites are wonderful cloth bookmarks with embroidered sights of cities or nature nooks, and some paper bookmarks with photographs of Norway’s nature. Is there any particular bookmark theme/kind/material you like to collect? I prefer cloth, wooden, metal bookmarks, as well as old ones. Paper bookmarks are not among my favorites. I only like them if they’re specially interesting or related to a special place or event. Do you exchange bookmarks with other collectors? Yes, I do. However, I cannot answer positively to all requests as most collectors collect free paper bookmarks. As I am not interested in them, I can’t exchange much. Still I have had some successful exchange with collectors from England, Russia, Belgium, Netherlands, Chile, Spain, Argentina and Australia, among others. How do you store and organize your bookmarks? I store them in boxes according to their materials: wooden, cloth, leather, metal, paper, magnetic, etc. And I display them on my blog. I also group them by country or sights and museums. However, ever since my daughter was born, she has occupied a lot of my time, so I have not been able to put up photographs of my latest bookmarks. I hope to have more time in the future when she is older and to renew my blogging. Do you also use a bookmark from your collection? Yes! I use them according to my mood or genre of the book I read. 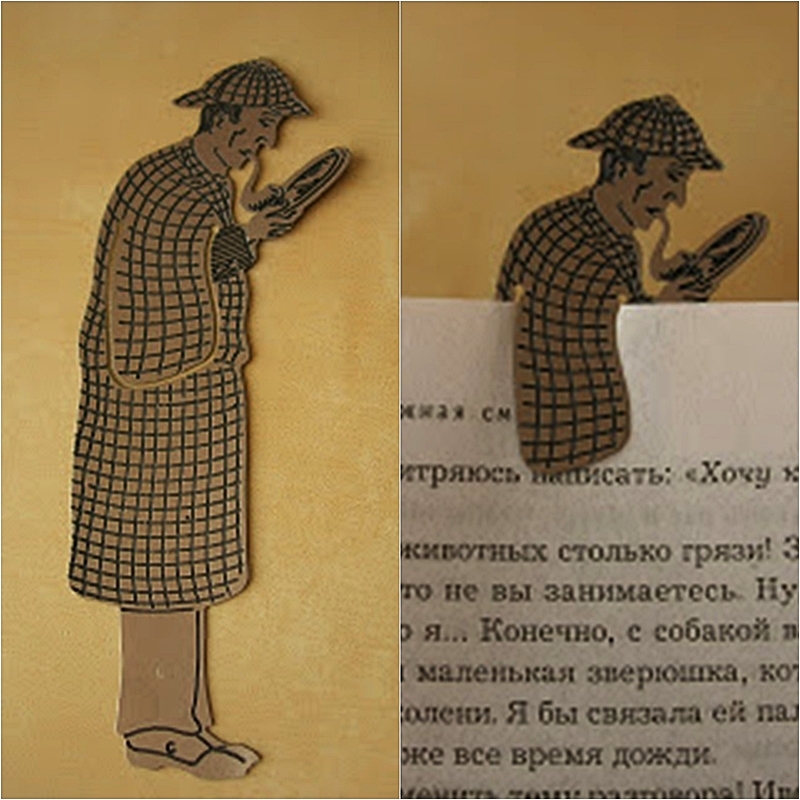 Like when I read a detective novel, I prefer a metal bookmark with Sherlock Holmes or I choose a romantic one when I read romance, etc. Do you think bookmarks have any value other than to mark your page? It is not only a page mark but a good souvenir which does not occupy a lot of space and serves as a perfect means to remember a country or a place you visited. What’s the usual reaction you get from people when they learn that you collect bookmarks? Most of them are surprised that there are so many different bookmarks. People tend to think that bookmarks are just the paper ones. They are stunned by the variety of materials. They say that when they see these bookmarks in the shops, they wouldn’t realize these are bookmarks. Bookmark collection is my main and only hobby. I would call my other interests such as reading and travel “pleasures of life.” Though, I have two more small collections: fridge magnets and sculptures of trolls, but these are accidental things, just memories from the places I visited. I don’t exchange them with other collectors. What can you advise to other bookmark collectors? Any tips that you think they should know? I would recommend not to stick to free bookmarks and find the amazing world of different materials and varieties. You mentioned that you have loved books since you were young. Can you tell us what some of your favorites books are? I like different [genres of] literature. In sunny and warm periods, I choose “easy” books such as detectives or thrillers that don’t let me go from the first page till the last. I also like: Scandinavian authors: Jo Nesbø, Karin Alvtegen, Stieg Larsson, Lars Kepler; French author Brigitte Aubert; American author Tess Gerritsen; or chick-lit (here I can distinguish a Lithuanian best-selling and best-read in libraries, author Irena Buivydaite). During the cold periods of the year, I like deeper books like the classics, old literature or mysteries such as ones by the authors: Oscar Wilde, Herbjørg Wassmo, Selma Lagerlöf, Daphne Du Maurier, Diane Setterfield, Kate Morton, Marai Sandor and Mark T. Sullivan. Always believe: When you think that your collection is full and you have so many bookmarks that nothing can surprise you, you will still find new amazing ones opening another wonderful land both for your collection and personality. Hi Robin! Thank you for reading! 🙂 We had fun writing this as well.